Eons ago, in May, I planted the garden. 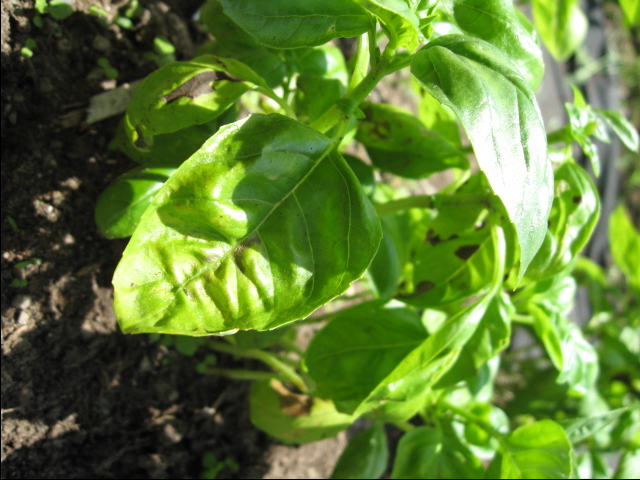 June, July and August I took pictures of sunny chard and glorious basil, radishes plumping and spiders scurrying. Early last week I tugged water- and wind-proof pants over my leggings and layered fleece under a nylon jacket, in order to brave 35 degree November weather. The newly arrived cold had trapped me for several days shivering in my apartment and in my mind: Go to the garden? Are you nuts? But that morning I warmed myself with yoga, breathed through anxiety about lists of other things to do, and gathered my tools, determined to salvage all the veggies before the hard freeze predicted to come after nightfall. Perhaps the produce could have survived outdoors for a week or two more, but I felt ready to put the garden to bed, which starts with the final harvest. My garden-mate and I had planted a second round of carrots in September and when I got to the garden, it was obvious where the plants had been thinned since then, and where they hadn’t been. 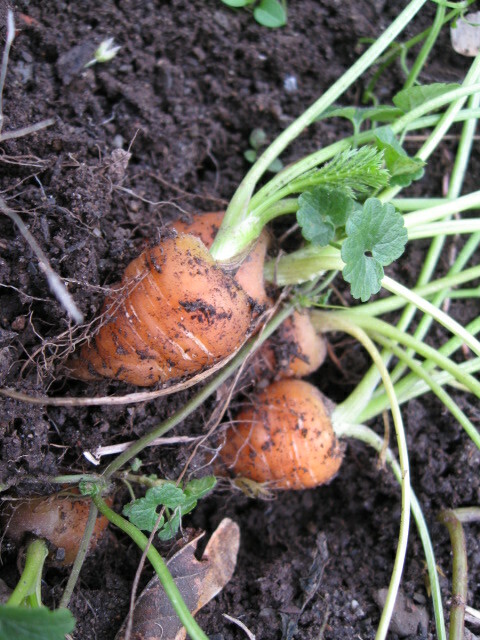 One carrot in its heft resembled a “regular” vegetable from the grocery store and even required a spade–albeit a small one–to dig it out. The rest were a little stunted, plump tops peeking out, but not going much further than a few inches into the ground, often radish-round in shape. 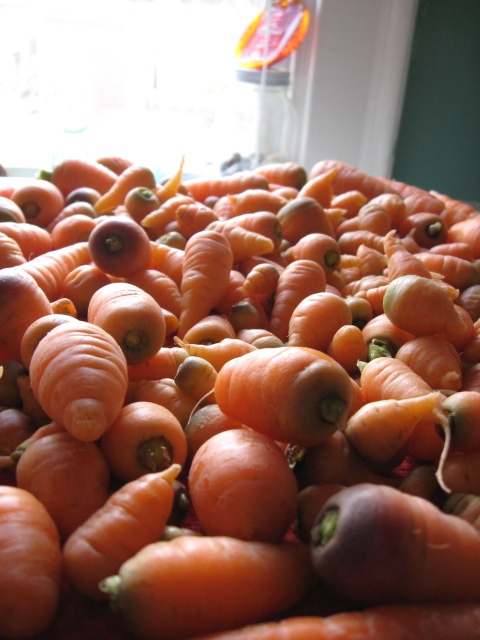 Over and over again, in un-thinned bunches, teeny, dollhouse versions of carrots emerged with a yank. They were pulled and bagged and hauled back to the apartment; later soaked in the sink, rinsed, soaked again with a little soap, then scrubbed individually until the dirt was non-existent, and rinsed once again. My reasoning for saving even the smallest ones: the cute lil’ nubbins would be sweet, even the tiny bit that only front teeth would be able to nibble. The minuscule seeds and the dirt and the rain and sun made these bright orangey treats and who was I to judge what was a big enough carrot to eat? All summer my garden-mate kept trying to get rid of my arugula. I wasn’t very good at keeping it trimmed, and he, not a big salad eater, kept snorting: What is this oversized dandelion? then, as it took over more garden space, Isn’t it time to pull this big ol’ weed? and Hmm, awfully bushy isn’t it? Watch it, buddy! I’d retort. This is an heirloom variety of arugula! and I can harvest more later; finally, Listen, they will re-seed for next year if I leave them. On harvest morning I tasted small new leaves hidden near the ground and pulled big rambles of vines. Yes, Garden-Mate, they were ugly and unwieldy, half-dry and tumbleweed-like, but still…they had grown new baby greens! I stuffed them in a huge sack and after the carrots were cleaned and drying on the countertop, I plunked down on my kitchen floor listening to the radio and pulled off these little slips, wafer-thin bits of spicy green, washed them and washed them and later mixed them with pea-shoots from the farmers’ market. I finally did what I said I’d do–use some of that late-season arugula–and that felt good. Next year I will tend them better. CONTINUING STORY OF THE WHITE CLOUD CAULIFLOWER. Way back when I harvested the sole surviving cauliflower, I debated what to do with it. It sat in a bag on the bottom shelf of the fridge for a long time. 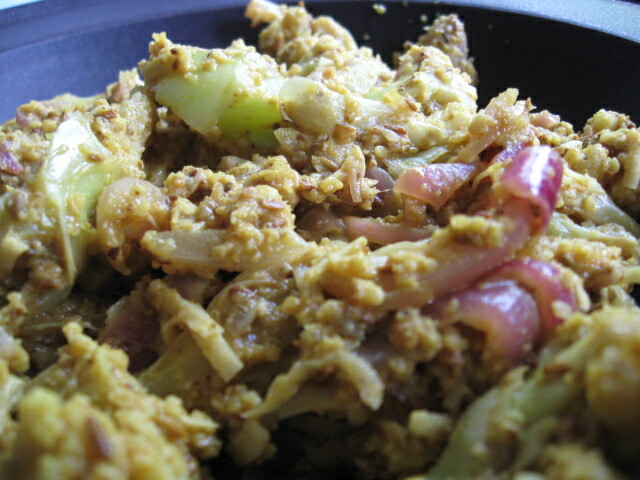 I first learned to enjoy cauliflower in yellow curries and so after about a month, I adapted a curried cauliflower recipe (thank you Moosewood once again! ), using whole cumin and coriander seeds. I only had red onions in the house–this is called making-do–and so pinky purple accented the greener than usual cauliflower. A quick raita (yogurt dip with cucumber bits) accompanied the dish, along with a selection of raisins, unsalted cashews, salted peanuts, and coconut shreds. Eating the concoction, I remembered: Whole is a different experience from powdered spice. Crunching the ribbed and rounded seeds in your mouth, the semi-bitter, aromatic flavor bursts out as they are ground at the moment instead of beforehand. A friend commented that I exuded cumin for a day or two. Perhaps too liberal a hand with those yummy little seeds? I couldn’t help myself–it had been too long since I’d played with whole spices.The cauliflower came to an excellent end. Every time a piece of meat with bone is roasted or baked in my house, I make my own stock; just cook the carcass in fresh water, put in all the scrapin’s of marinating-oil and spices and pan juices, simmer with salt, fresh ground pepper, chopped onion and bits of other veggies lying about, and then strain. 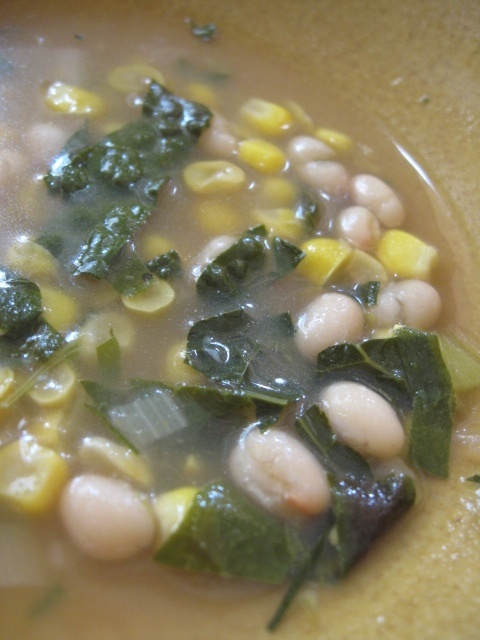 Here I used just such a chicken broth, garden corn and the red chard, along with canned white beans. 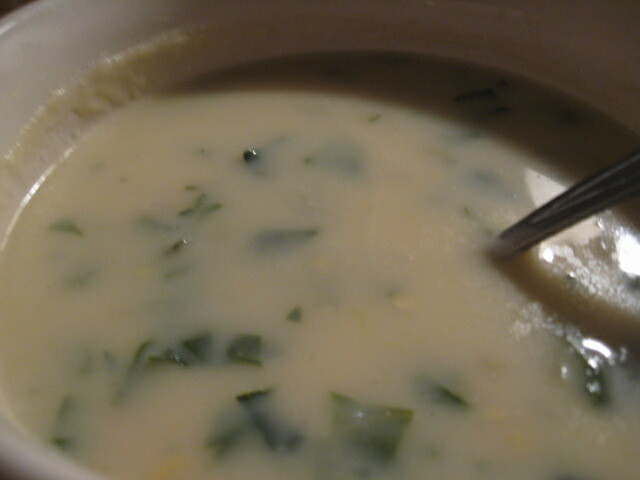 At the same time I made the garden veggie soup, I made vichyssoise; its more pedestrian name: leek and potato soup. More making-do: the glass milk jar was almost empty, so I added the last of my half-and-half for tea, to the potatoes and butter and leeks chopped up and sautéed with regular onion, then blenderized to pale yellow smoothness. In the spirit of play, I created a third soup by mixing the two–some veggie bean soup into vichyssoise, and voila! a creamy textured soup, ingredients suspended in a completely different way from clear broth. The fridge and freezer were filled, dirty stockpots and cutting boards stacked up for cleaning. Tomorrow I go back to the garden to truly put it to bed: clear out dead plants, mulch the soil, and take down the protective fencing. As the snow and wind blow, the woodchucks will dream their sweet overwintering dreams about spring–as will I. But when I dig through the freezer during December and January, soups from the summer harvest will turn up; in February and March, behind chocolates hidden for self-protection, frozen beans and chard will materialize. My own dried parsley and dill have taken their places in the cupboard next to cinnamon and nutmeg from far away lands. Is there deep inner meaning here? Revelation? Maybe just satisfaction, living in the work of the day. 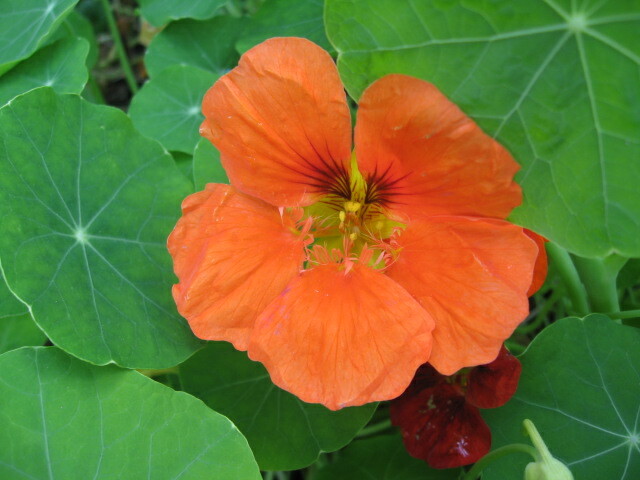 Orange and red nasturtiums bloomed summer into fall. As someone who cooks a lot, for myself and others, I use fair trade, seasonal and local, and/or organic ingredients, whenever possible. Call me crazy but I just believe in these defining attributes strongly, try hard to find them, and encourage others to prefer them over imported, old, pesticide-covered & water-polluting, factory-farm, long-distance food. As a city dweller without yard access, my fresh veggies with those descriptors come from the farmers’ market, the local grocery, and in the summer, my community garden plot. “Community garden” just means I grew it myself, or a friend did, in a local shared garden; in the Albany & Schenectady area, that would be part of Capital District Community Gardens. Basil. Many poetic words have been waxed about its delicious properties, its pungent, fruity addition to dishes. But look how gosh darned pretty it is, coming out of the dark earth, growing hard in the night and day! I can taste the sun in it, taste other seashores and countries. As long as I pinch off the tops to keep it from bolting (flowering), it will continue to give me pesto and Thai-spiced vegetables and lime & basil vinaigrettes all summer. 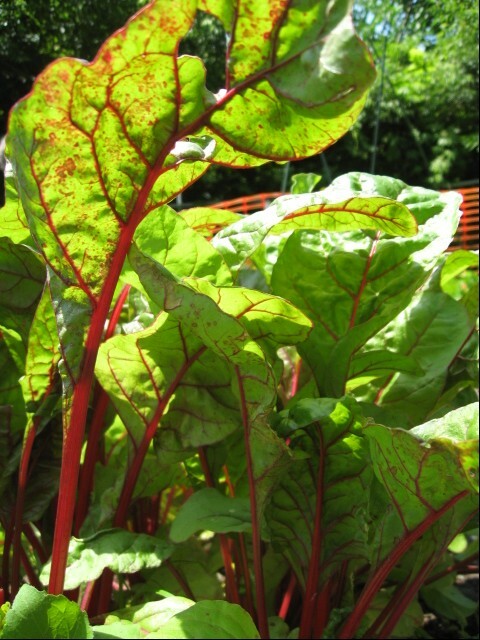 And nothing like the morning light streaming through red chard….Yes, it got a bit old and spotted before I got to it, so I picked leaf after leaf, and tossed it all into green bags in the fridge until it could be washed properly; yes, I used the fancy salad spinner, rinsed it again and again to get the grit off, spin-spin-spin, and then finally cooked it all down. Mild and wonderful to float in soup or drop into stir-fry, it’s one of the “top ten vegetables” for nutrition. Go chard, you subtle thing, you. Can I tell you what happens when you plant radish seeds in the ground, water them and then leave town without thinning them? 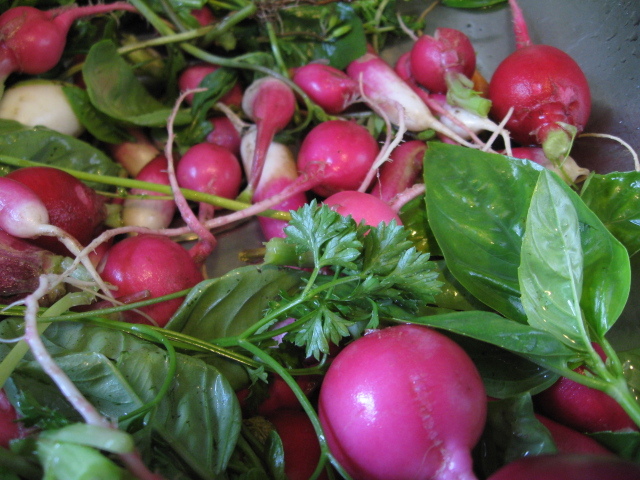 You get a lot of radishes. I ended up with piles and piles of mildly spicy roots popping up out of the ground, mostly red but many pink, and a few exciting purple ones. You’ll see the basil here in the sink too, and a little parsley: clean flavors to go into my salads. 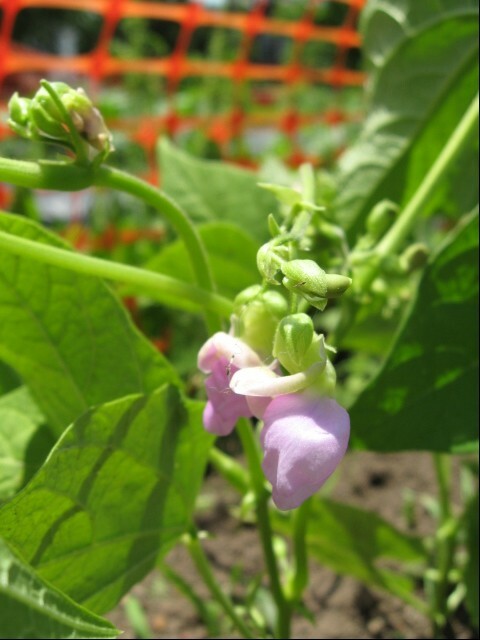 Finally, this is a picture of my bush beans, before they were beans, back when they were just beautiful pinky-purple flowers. I watered, weeded some, went out of town (see above), came back, and almost missed the long stems of bean, hanging hidden behind leaves. They would have been spotty themselves and over-ripe the next time I came to my plot, if another gardener hadn’t pointed them out to me while I was frantically weeding the nasturtiums and watermelons. 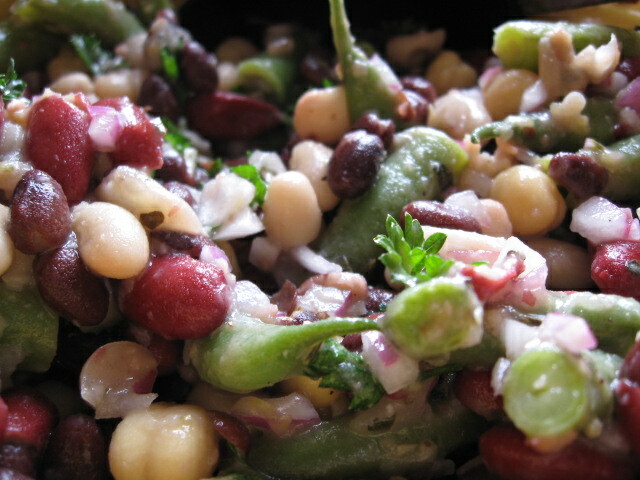 The former-flowers now-beans have been turned into Five Bean Salad, complete with parsley picked the same day. 1 can each of well-rinsed dark kidneys, black beans, great northern beans, garbanzo beans—or whatever else you’ve got. Mollie recommends freshly cooked beans, but it was just too hot this week! Mix all the sauce ingredients together. Cook the green beans in a bit of water (1/2 cup to a cup) until tender (5-10 minutes depending on their age and your definition of “tender”; some people like a crunch to beans; others desire complete abdication). Mix green beans with canned beans and other ingredients in a big bowl. This version is much lower fat than the original; I wanted to be able to taste the lemon and the different beans’ nuttiness more than just taste and feel the oil; a cup measures roughly 225 calories. Yummy cold or room temperature.